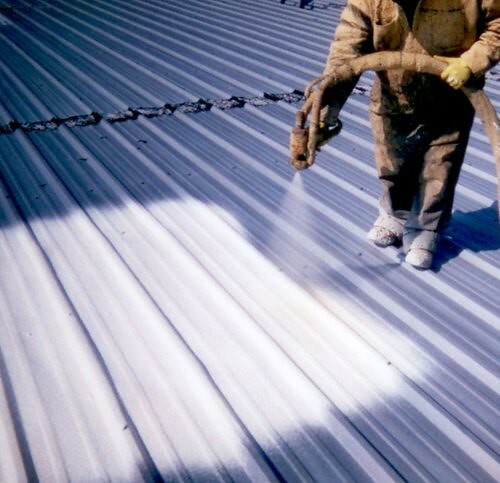 Laminated roofs and roof covers that have water and air filtrations, breakages and other problems can be recovered through the exterior part with polyurethane foam insualtion and expand their lifetime for a similar or longer period of time compared to a new roof cover, obtaining the benefit on insulating the sun’s rays heat and reducing over 30% of your roof’s temperature. This will give you a comfortable workplace environment and energy savings up to 40%. 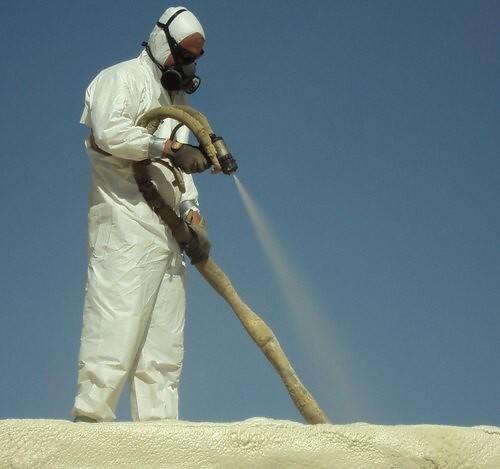 The Polyurethane foam also has excellent properties such as acoustic insulating material.It is a synthetic material and thermosetting, highly cross-linked and not fused, which is obtained from the mixture of two components created from the chemical processes involving petroleum and sugar: Isocyanate and Polyol. The mixture provides, under ideal conditions, foam with a variable rigidness according to the proportion of each of the two products that were used during the process. 5cm of polyurethane foam is equal to 15cm of polystyrene plates with the advantage of not having any mergers. The investment of the application is paid off in a short amount of time with the lower energy consumption derived from the air conditioner. Polyurethane foam is known for being an insulating material with very good reliability; furthermore you can apply lower levels of thickness obtaining similar reliability than other materials in higher levels of thickness. Its application can be done from the inferior part or from the superior part. 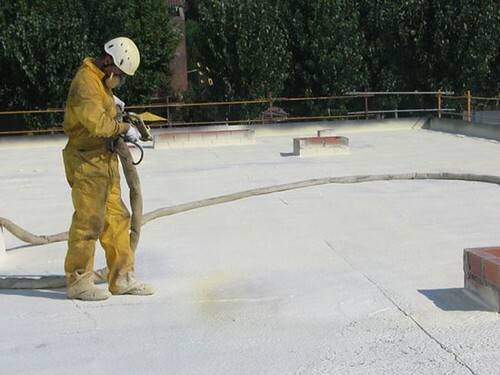 The application of polyurethane foam waterproofs, insulates and seals efficiently, thereby avoiding the formation of moisture due to condensation and eliminates potential thermic bridges. The layer of this foam can be applied to different surfaces: the application includes tanks, pipes, frigorific cameras, floating elements and civil construction. It is especially appropriate to roofs and walls. The rising energy costs have compelled people to take another look at home insulation. What was once a disregarded overlooked step during home construction is now a mandatory standard for proper home insulation and safety. Of the numerous products to emerge, polyurethane liquid insulation foam spray has been showing promising results and garnering positive reviews from users. It has been steadily emerging as the preferred choice among homeowners and commercial property owners. Polyurethane presents itself as an ideal solution for new constructions and rehabilitation of buildings, especially in the covers of these which is the part that loses the most amount of heat, it seals all types of irregularities and cracks, levels inequalities, adds little weight to the constructive solution and improves the structural resistance of the complex, which avoids the complete sanitation of substratum for reparation. 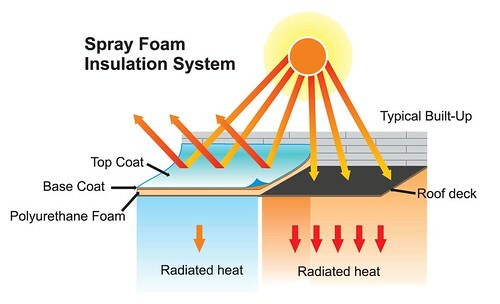 The thermic insulating capacity of polyurethane foam is not obtained with any other insulating material known. This special characteristic is due to the very low thermic conductivity that the foaming gas possesses excluded from the interior of the closed cells. 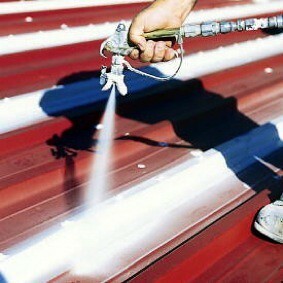 Polyurethane foam provides excellent insulation through the spray and injection methods. Reduces Energy Costs – The first and most noticeable reason of using this material is reduces energy costs. With the home properly insulated, it will be easier for homeowners to control the inside temperature which will result in reduced heating and cooling bills all year long. Completely Safe and Toxic Free – Arguably one of the most welcoming benefits of this foam insulation material is its excellent safety record. There are no left behind toxics or debris. There are no side-effects. You can get your loft insulated and immediately start using it within a few hours time.